Alumalite Zero™ is a very lightweight, low cost, modular exhibit system made from Octanorm™ framing to create a solid, professional looking trade show booth. Each kit includes a Limited Lifetime Warranty. Available in 8 exhibit kits of uniquely shaped headers and wings. If you have any questions about choosing the right kit—or want your own custom solution—please call us toll free at 1-855-536-3385 or contact us by email. 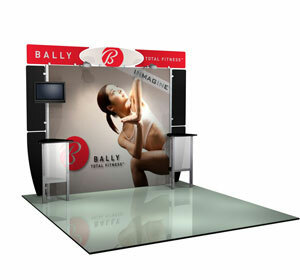 A 10′ trade show booth with counter, shelves and graphics.